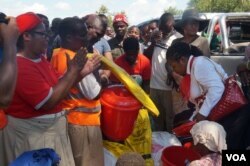 Malawi has appealed for international aid for nearly a million people affected by floods from Cyclone Idai. Authorities say people in cyclone-affected areas are in dire need of food, water, shelter, and sanitation. The appeal is for aid targeting 162,000 households in areas worst hit by Cyclone Idai's flood waters. "Our intention is to tell the world that Malawi has a big problem regarding the natural disaster that has befallen us," he said. "It's an appeal to both monetary and humanitarian assistance to the international world even people of goodwill to come for an assistance. There is desperation in the camps." 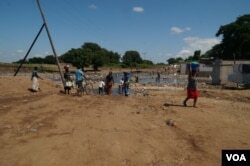 Malawi's Department of Disaster Management said the country needs about $43 million for cyclone relief. But authorities say they have secured less than half that amount. In many areas of Malawi's East Bank, providing cyclone relief aid is still a problem because of damaged roads and bridges. "The United Nations is working towards implementing the plan," she said. "We are already mobilizing from out [of] central emergency response funds. It's now pointing to [a] million dollars but we are acknowledging that actually it is not enough and will continue with the effort to bring more attention." 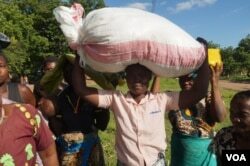 Malawi President Peter Mutharika in early March declared half the country's districts disaster areas.